Alemill is located close to the small towns of Eyemouth, Ayton, and Coldingham in the Scottish Borders. We are a stones throw away from the main A1 giving us easy access to Edinburgh (50 miles north) and Alnwick and Newcastle to the south. 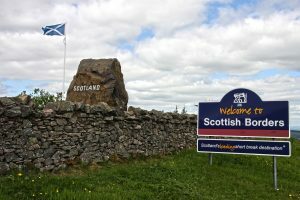 The Scottish Borders can boast some fantastic attractions and days out for the whole family. Our self catering holiday apartments are catered for the relaxing holiday you deserve or equally a good base for the more adventurous. The Scottish Borders also hosts many Castles, Magnificent Stately Homes and Beautiful Abbeys. Eyemouth is a busy fishing port and hosts a wide variety of fishing boats and trawlers. Each year the town holds its famous Eyemouth Herring Queen Festival and is enjoyed by many locals and visitors, the first Queen being crowned in July 1939. The Queen represents ‘peace’ and ‘the ideals of the fishing community’. The week long festival showcases local music, dancing, parades and celebrations for the town. Our neighbours over the border in Berwick-upon-Tweed host a similar crowning of a Queen, The Salmon Queen, to bless their local fisherman. Coldingham is a few miles away from us too and has a beach popular with surfers, day tripers and walkers. The walks along our coastline are stunning and the pathways are maintained to a high standard. If you are bringing your dog with you then they will love it. Marine Quest – Diving, sea angling and sightseeing trips in Eyemouth. St Abbs Head Nature Reserve – A beautiful walk will help you take in this unique natural feature. Eyemouth Swimming Pool – This is a public pool. Whinney Loch – Private fishing. Eyemouth Museum – Eyemouth Museum is based in the centre of the town and documents the fishing and social heritage of the town. Gunsgreen House – Built in 1753, Gunsgreen House was designed by John Adam – one of the most famous and expensive architectsof the day – for a local man named John Nisbet. By day, Nisbet was a local merchant, but by night he was a notorious smuggler. Ayton Castle – Ayton Castle is an important Scottish baronial mansion to the east of Ayton in the Scottish Borders. The present castle dates largely from the 19th century. Paxton House – Paxton House offers a great day out which will most certainly include a tour of the House, led by friendly and knowledgeable guides. Manderston House – Manderston is the supreme country house of Edwardian Scotland; the swan-song of its era. A house on which no expense was spared with opulent staterooms, the only silver-staircase in the world and extensive “downstairs” domestic quarters. Floors Castle – Home to the 10th Duke and Duchess of Roxburghe. Check out the website for information on events throughout the year. The Holy Island of Lindisfarne – In 635AD Saint Aidan came from Iona and chose to found his monastery on The Holy Island of Lindisfarne. The Christian message flourished here and spread throughout the world. 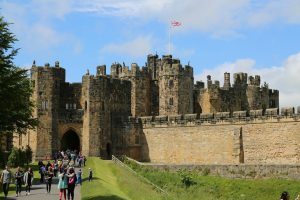 Alnwick Castle (Hogwarts) – One of Britain’s most iconic castles. Previously, Alnwick Castle has featured as Harry Potter’s Hogwarts and Downton Abbey’s Barncaster Castle. Edinburgh Castle – Standing on its great rock, Edinburgh castle dominates Scotland’s capital. Great events have taken place within its wall and it has witnessed many sieges. 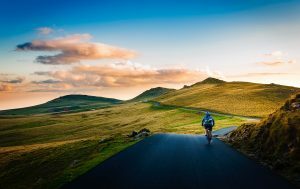 Cycle Scottish Borders – A great website detailing routes, events and tips to get the best out of cycling in our area.